I mentioned a few weeks back that we were going to have house guests on and off for several weeks this summer. I just love house guests!! 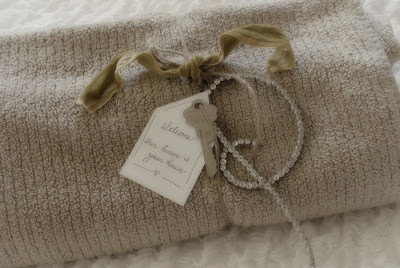 First, I tied the top towel up with some twine...and added this sweet handwritten tag and a key to the house so my guests can come and go at their leisure. 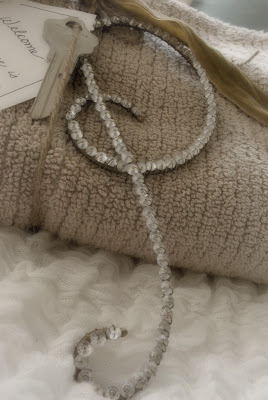 Then I added a blingy initial (theirs, of course) tied on with some vintage velvet ribbon as a little memento for my guests to take home. It's small touches like these that make guests feel welcome and loved! My dear readers, do you have any great entertaining ideas that you use for house guests? I'd love to hear them! Okay, when can I book in? You sound like the best hostess eva! I always like to make up a breakfast basket when we have guests. So cute!! :) I love this personalized touch! That is so pretty, love it. When I have guests over I use a basket to place their towel(s) with little things such as soap, shampoo, toothpaste, lotion etc...sometimes I add a bit of chocolate too, if I know they like it. I love this idea! 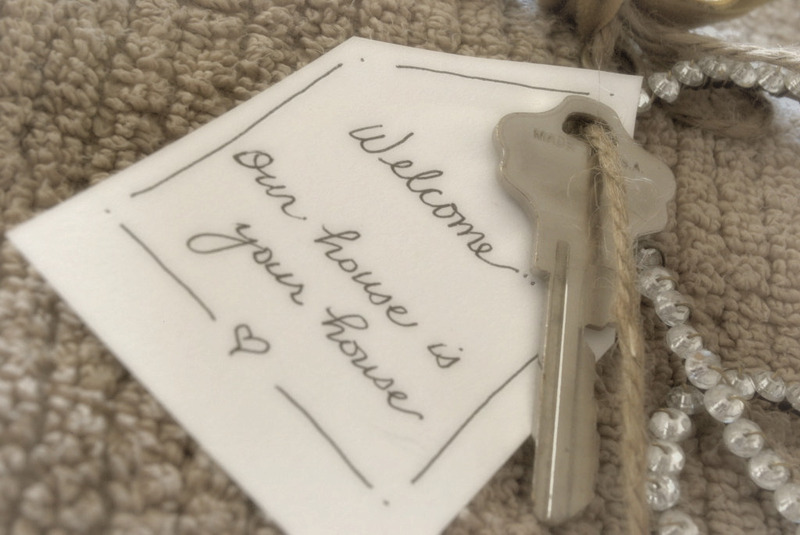 What a great way to make guests feel welcome. The key alone is a great idea, but making it pretty makes it that much more special. I always leave a basket with breakfast bars and other snacks in our guest room. (It even has packets of Emergen-C). Whatever I can provide that they don't have to "ask" for. okay, can I be a guest? Love this idea. So cute!! Thanks for the tips! And your Bed and Breakfast is opening soon..I hope:)? This is such a fun and thoughtful idea. Your house must be a wonderful place to stay. This is a wonderful and creative idea! Something as simple as this can have lasting and loving effects - which of course is just what we want for our guests! I can't wait to tuck this idea back for when I have company someday!! :) Thank you for sharing! What a great idea! Can I come visit?!? Thanks for your post - it's just in time as I am working hard to get my craft/guest room in shape for a visit from the in-laws. They usually stay at hotels and I want them to feel at home and comfortable. I have ordered my favorite eye masks, they are contoured and come in a soft bag with a pair of ear plugs. I also plan to pick up some slippers at BB&B or wherever I can find comfy ones for a reasonable price. I am totally going to steal your idea for the towel and key presentation! Our house isn't that big, so I don't plan to include snacks, but maybe a couple bottles of water with personalized labels will go in the room as well. I love having house guests, too. I try to do little things to make them as comfortable as possible. I recently had a friend come to town who was from a different time zone, so I knew her schedule would be a couple hours ahead of ours. I put together a cute basket of goodies for her such as: bottled water, almonds, crackers, gum, mints, chocolates, moose munch, animal crackers and then some trial size toiletries. Just a few things, ok, maybe I went overboard, but I wanted her to be comfy and not have to leave her room super early or late for a snack or drink. I LOVE having guests too and have been thinking lately about what I can do to make them feel welcome. If you have more ideas please please share. When I hosted our family reunion, I had all of our bedrooms full of family, so I bought inexpensive pillow cases and embroidered their first initial on the end of the case. Everyone seemed to be very pleased and I made sure they took it home to remember their stay with us. I also do the bathroom basket, don't forget individual toothbrushes...someone always needs one! What a great idea and presented in such a lovely way!